I've been creating wire art jewelry for over 20 years. The pieces that I make reflect the stress and lack there of in my life. My family is so very important. This picture is the last one of my children, their spouses and grandchildren all together. In the past eight years I lost two sons and one daughter-in-law and I miss them so very much. (I cannot believe that this year it has been eight years have passed since Adam's death). Creating the different pieces of jewelry keep me going. Some pieces are mundane and others are just different. Thanks for looking. Blessings to all. teapotgallery doesn't have any items in their booth! teapot is a wonderful and friendly Bonz member ! I highly recommend her both as a seller and a buyer ! WONDERFUL person to do business with – always prompt, efficient, and friendly. Just a wonderful person – period. 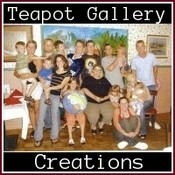 Can’t go wrong with teapotgallery A great asset to the Bonanza Community! Wonderful lady! Great seller! Perfect buyer! Can’t ask for anymore than that! She is wonderful with customer services, messages, etc. Comes very highly recommended from me! Thanks so much my friend! Teapotgallery’s does beautiful quality work. Great communication and nice to do business with. Thank you for all my treasures so far. Beautiful items, beautiful work! It’s a honor to know teapot, she is one of the kindest people I have ever had the pleasure of knowing. I encourage everyone to take a moment to browse her booth and favorite her! Anyone that pops into my b00tH dropping POSiTiVE energY = definitely deserves my individual PERS0NAL eND0RSEMENT ~ Please take a moment to visit members’ (teapotgallery) b00tH next…MONTR0Se approves this message!